JOAN Lite | G & D Enterprises Inc. The little plugin that can! JOAN Lite is a free WordPress plugin that lets radio/TV site admins easily manage and display their programming schedule. Jock on air now (JOAN) displays the name of the current show, DJ or host based on your filled in time-slots. You can also display the show/jock for the next time-slot. If nothing is scheduled, you can add a custom off-air message. 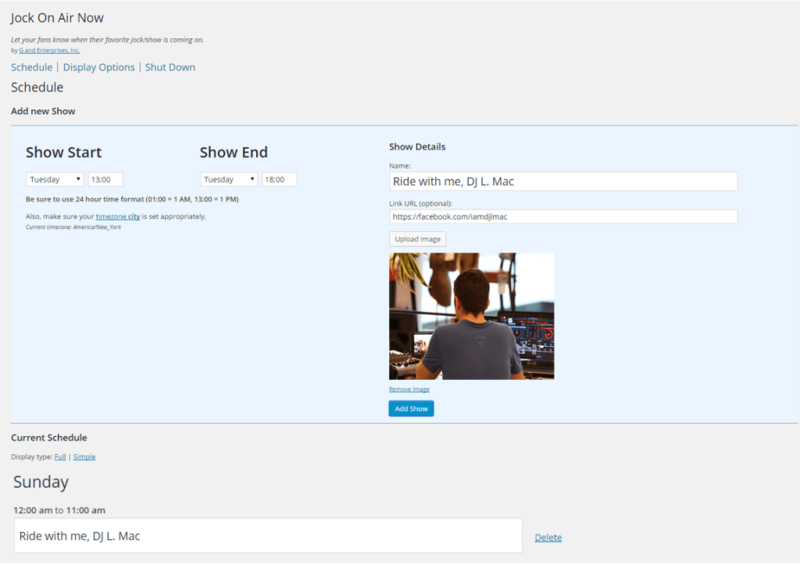 You can show your users your full schedule on any post/page. Download and install using the standard WordPress plugin installation method then activate the Plugin from the Plugins page. Find Jock on air now in the Admin menu click to begin adding or editing your schedule. You must, Set your time zone using your city name, set your time format to 24 hours (See WordPress General). Enjoy JOAN! *IMPORTANT NOTICE: If you have version 4.1.3 or lower installed please upgrade to version 4.2.0 includes major fixes a couple of Functions. Along with a few minor text format changes, also we added a new function and shortcode.